For many, starting innovation is a struggle to master. Studies show that only a quarter of all organisations are effective at the start of innovation. The FORTH method is designed to start innovation effectively through the combination of design thinking, creativity and business reality. 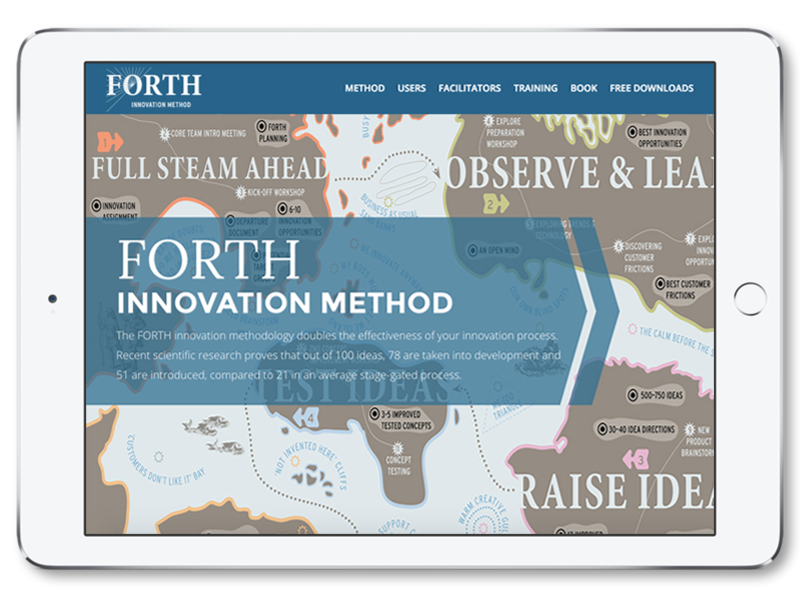 FORTH is an acronym based on the 5 key steps of the process: Full Steam Ahead, Observe & Learn, Raise Ideas, Test Ideas and Homecoming. It will help you structure the chaotic start of innovation and foster an innovative ecosystem across functional and hierarchical boundaries. The deliverables of your expedition are 3-5 new mini business cases for innovative concepts which fit the reality of your organization and your customers' needs. One doesn't discover new lands without consenting to lose sight of the shore. An unprepared expedition could well end up at the wrong destination. Good preparation not only increases chances of success but also creates a sense of priorities and a shared desired to succeed. 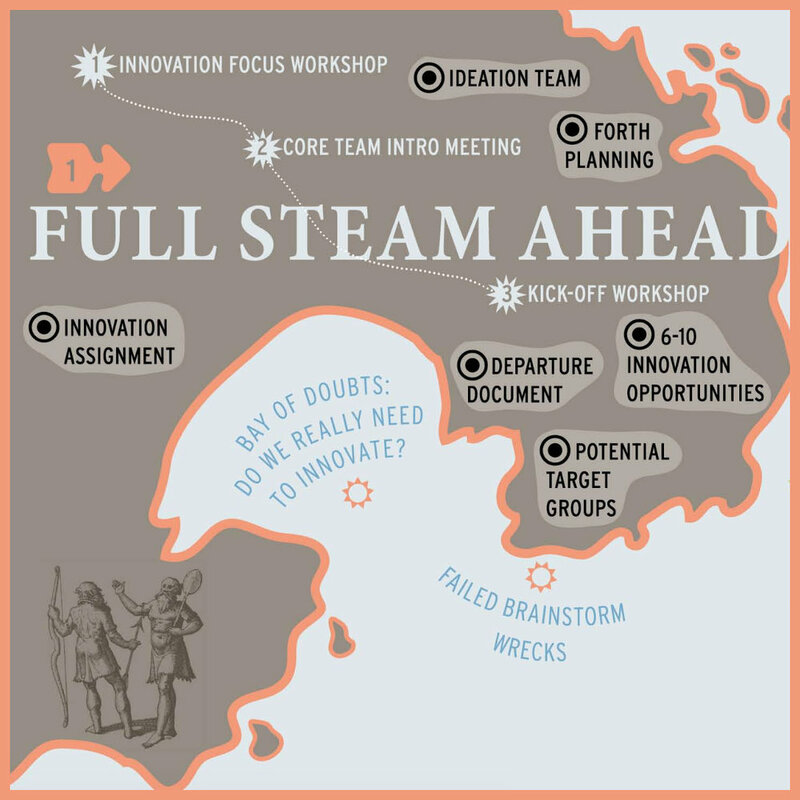 'Full Steam Ahead' sets the stage for real innovation projects, based on a clear assignment that drives focus, purpose and relevance. At the end of this phase, a multidisciplinary and enthusiastic team will be ready and well-equipped to start their Innovation Expedition. Innovation starts with viewing things differently by letting go of existing thought patterns and habits. With fresh insights, 'Observe & Learn' allows the ideation team to explore trends and technologies through the lens of customer frictions. It challenges participants to share findings in a way that truly inspires others. Following this stage, a highly inspired ideation team will have identified customer pains and uncovered valuable innovation opportunities. Let creative juices flow, starting with a brainstorming session where new ideas will be identified, structured and embodied into formal concepts. Next, all concepts for new products, services or business models will get further refined in a concept improvement workshop. 'Raise Ideas' is the creative peak of the Innovation Expedition. 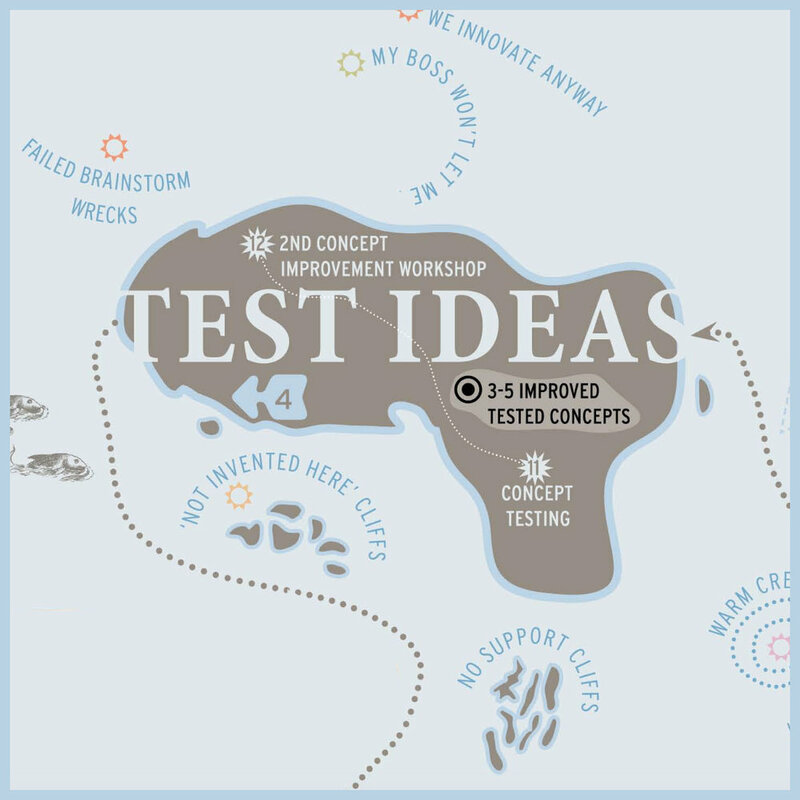 It allows the ideation team to deliver twelve new concepts for innovative products, services or business models, all ready for concept testing. How attractive are these concepts and how many truly stand out? Time to reflect on this together with customers and improve the concepts based on their feedback. 'Test Ideas' aims at understanding your target group's behaviors and preferences, which will help you validate why and how they react to the new. At the end of this fourth stage, the ideation team will have tested and shortlisted three to five best concepts which will then be developed into mini business cases. In this final stage, the expedition returns home with a selection of attractive new product or service concepts to fill their innovation pipeline. 'Homecoming' allows key decision makers to select those mini business cases that will be prototyped or become full development projects for new products, services and business models. Your Innovation Expedition will end with the integration of the most relevant concepts into your regular solution development process. FORTH® service marks, trade names, trade dress and related intellectual property are the property of Van Wulfen Consulting B.V. Curious how FORTH can guide your journey?